The San Jose Math Circle (SJMC) is a weekly math meeting for middle school and high school students. Around 60 students come each week and are presented with difficult, original and always fun mathematical puzzles. Tatiana Shubin was born and grew up in the USSR. As an eighth grader she attended a specialized physics and mathematics boarding school in Siberia. Her experience interacting with working mathematicians kindled her passion for the subject and was very influential in her later choice to embark upon an academic career. Upon arriving in the United States, Tatiana earned her Ph.D. from UC Santa Barbara and joined the faculty of SJSU in 1985. At that time she started a math circle for local high school students, but it was discontinued after two years, mostly for lack of interest from students and colleagues alike. Tom Davis received his Ph.D. in mathematics from Stanford, completed a post-doc there in electrical engineering, and became one of the founders of Silicon Graphics. He worked as Principal Scientist until his early retirement in 1998. Since then he has been devoting much of his time to teaching young people lively mathematics and creative thinking through problem solving. Early in 1998 Tatiana and Tom heard a presentation by Zvezdelina Stankova on the math circles she had attended as a child in Bulgaria. She proposed that individuals in the San Francisco Bay Area launch circles in their communities as well. This idea resonated with both Tom and Tatiana, who felt that there now existed a critical mass of like-minded people to make the endeavor a success this time around. The San Jose Circle has been operating ever since. Currently around sixty students attend each session; the large majority are in middle school. During the 2005-2006 academic year there were 23 meetings led by 15 different individuals. 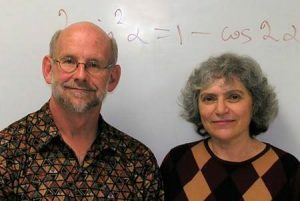 Among these were research mathematicians, such as Elwyn Berlekamp, Brian Conrey, Ioana Dumitriu, and Paul Zeitz; and experienced math circle leaders such as Joshua Zucker and Sam Vandervelde. With so many different leaders, the circle attendees see a great variety of mathematical styles. The last meeting of every school year consists of the traditional pizza and puzzles party. Students and parents alike enjoy free food and a great variety of challenging puzzles.